Many people think that Golf is a relatively benign activity, but the incidence of injuries to golfers is relatively high. Because golf can be played over an entire life time, most golfers, at some stage, will be injured. Lower body – What is the lower body doing, is it strong enough, is it balanced? The core – We see if that’s working and what kind of stability and rotation is being maintained. The neck and the arms – Usually they are the last point of reference in a golf swing, because often these parts are forced to compensate for what the rest of the body is not doing properly. Back pain is the most common complaint among golfers, in particular in older golfers. However, back pain isn’t the only pain golfers tend to suffer. 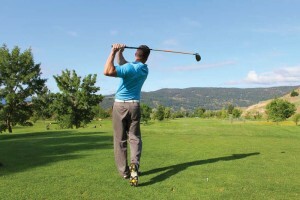 Neck, shoulder, elbow and hip pain are all common complaints among golfers of all ages. Specific joint mobilisation and manipulation. Rehabilitation exercises that are individualised to the golfer’s body type, swing mechanics and likes and dislikes. Golfers rarely consider the damage that the sport’s repetitive, torqueing movements inflict on their backs, necks and shoulders. Neither are most recreational golfers proactive about preventing injury to these areas and improving performance. While many golfers now see a Physio after injury, some are discovering that seeing a Physio before injury is the key to playing round after round without pain. The golf swing is a complex series of movements, and many golfers are limited by their physical capabilities to perform these movements, whether it is due to poor coordination of their body segments, lack of adequate flexibility, or lack of appropriate control and strength. Physiotherapists can identify these physical restrictions and implement an appropriate program to address these. By eliminating these physical restrictions you will improve your capability to swing the club better. The way we posture and move ourselves on a daily basis can affect the ability for our bodies to work optimally in a golf swing. Key muscle imbalances develop when we use our bodies poorly over the years. Poor movement habits develop as we compensate for old injuries. New injuries occur as we compensate for poor postures, poor movement habits and old injuries. And all these can manifest in your golf swing. If players have a strong left side, they tend to continue using it more and more until the right becomes a lot weaker. If your left side is excessively strong it can eventually get damaged too because it’s doing too much work. The body has to be symmetrical and plum-line. It’s a bit like baggage handlers who have to keep swapping the loads from side to side because eventually the strain on one side is too much. It’s about corrective exercises rather than generic workouts. The way forward is to get properly screened by a physiotherapist, to get a better understanding of the functions of the golf swing. Everyone has their clubs custom-fitted these days, now you can custom-fit your body as well. Good trunk rotation is a key part of the golf swing. In particular the thoracic spine (the section of the spine that has ribs attached) is responsible for the majority of the trunks overall movement. Restrictions here can lead to excessive strain being placed on the lower back and neck; this can shorten the length of the overall swing and reduce efficiency of the swing. Other joints may try to compensate for this lack of movement by becoming more mobile. The lower back is one of the most common injury sites in golfers. The golf swing ends with extension of the lower back. Good control and strength of the abdominal muscles is required to prevent hypertension of the lower back which can cause disk and facet joint injuries. Good rotation of the hips, in particular good internal rotation of the lead hip, is important in a good follow through of the swing. Restriction in this area will lead to extra strains and stresses being place on the lower back and on the lead knee making them vulnerable to injury. The golfer needs good neck rotation and stability to enable good eye-to-ball contact, during the golf swing. Restrictions within individual joints will disturb the overall movement of the neck. Some golfers find it difficult to avoid hunching the back during their stance phase. This slumped movement prevents full rotation of the spine during both the back and forward swing. With the appropriate cues the golfer is able to learn how to hold the spine in a neutral forward/backward position and increase the range of movement and power, and this lower the risk of injury. Whether you’re a professional, an amateur or just a recreational golfer, your body deserves the necessary preparation to avoid injury. A Physiotherapist can give you proactive treatment, strategies and advice that can serve as the foundation for realizing your full potential on the golf course while offering the opportunity of playing your best golf safely and injury-free for an entire lifetime.